Many considered buy buttons—little additions to social networks that allow users to buy what they were seeing—a major step forward for social commerce. Instead, they faltered. Conversions were dismal. Buy buttons failed for two reasons: 1) incorrectly calibrated expectations; and 2) because they ignored known truths about consumer buying behavior. When major platforms such as Facebook, Instagram and Pinterest first announced buy buttons, their impact could not be understated. The thinking was as follows: Buy buttons are going to reshape the social commerce landscape, allowing consumers to purchase where they spend the most time, and allow brands and social platforms to monetize like never before. As with all forms of hype, especially during a time when the fashion world is struggling to adapt to the new digital future, this set up a lot of expectations for these buttons to boost sales for brands, all while allowing social platforms to make money off of each purchase. But there was a more fundamental problem: buy buttons, and the expectations, ignored an important tenet of purchasing behavior: most people don’t buy things upon first glance. Some call this effective frequency. Purchases happen after repeated exposure. For Gioventu, sales, on average, happened on a user’s fourth visit to our website. First, the user glanced at our site. Second, he came back and looked at more specific products. Third, he came back and added something to the cart and thought about it. Finally, on the fourth time, he came back and placed his order. For some brands, four rounds of exposure is a poor conversion frequency, for others, four visits is a dream. The infographic above from Stratechery, Ben Thompson’s excellent publication, outlines the consumer purchasing funnel. Social platforms provide an immense amount of value in the Awareness and Consideration parts of the funnel. A user sees an image on Instagram or is retargeted with an ad from a previously visited website. Social is perfect for these two broad, upper levels of the funnel, as it has supplemented and is starting to replace brand advertising (TV, radio) and classified advertising (newspapers). Buy buttons were created to increase purchases. But these social platforms, specifically Instagram and Pinterest, thrive at Awareness and Consideration, not Conversion. Therefore, buy buttons were trying to stimulate a purchase outside of the conversion level, which does not work. This misalignment led to the subpar performance of the buy buttons; they were outside of their domain. One way to fix buy buttons is to redesign them as something closer to “I’m interested” buttons. Brands and the platforms themselves should build tools that allow users to bookmark and explore items they like or stumble upon. If a user sees a picture on Instagram, she should easily be able to find that image or product anywhere she wants, from a browser, to a desktop to an iPad. The silos around these social platforms, and the expectation that everything from Awareness to Conversion will happen within one app (such as Instagram, Facebook or Pinterest), needs to be suppressed. Instead, the content, data and products need to follow the user anywhere she goes. A more nuanced and sophisticated approach would allow brands to track users across different levels of the funnel. The current incarnation of buy buttons is binary: either a user buys something or she doesn’t. This ignores the existence of a funnel. Instead, the button design and call to action should progress as the user moves through the funnel. Early on, maybe the platform just records when a user likes an image (Awareness). Then, the next time she’s exposed to the image or product, the “I’m interested” button shows up (Consideration). 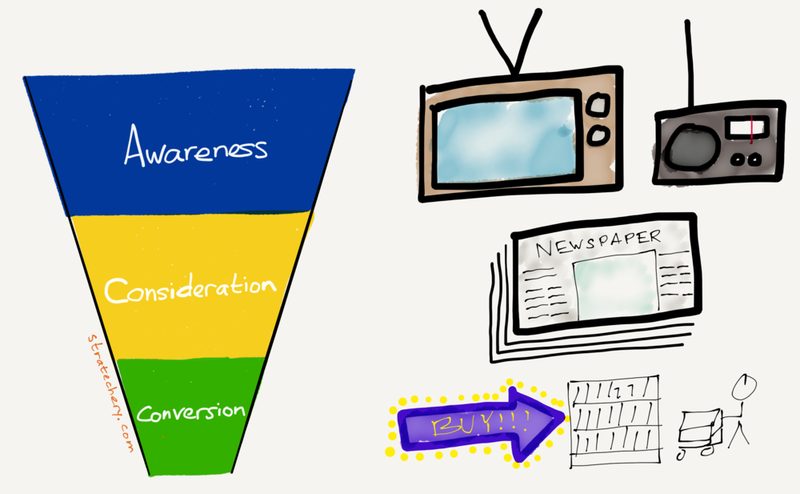 Then, maybe the buy button shows up, since we’re now at the bottom of the funnel (Conversion). A clear progression of buttons that maps to the funnel is better for the consumer, and allows the brand to optimize both paid and organic campaigns for better conversions. Buy buttons need to be reimagined from the ground up. Only then, with a deep understanding of the truths of consumer behavior, will buy buttons realize their potential.